Symmetrical, stylish and practical. Carry the TRT 10 Shoulder Bag from Jack Wolfskin over your left shoulder or your right shoulder–it's just as comfortable either way. Access to the compartments is good from both sides and thanks to its innovative 3-point strap attachment system, the bag doesn't sway around when you're out on your bike or running for the train. TRT stands for 'tough, rough, technical'. The bag features an innovative new gear loop system. The TRT 10's modular gear loop system is a particularly clever feature. The gear loops are partially concealed behind the slatted panels on the front of the bag and can be pulled out when needed. Each loop also functions as a reflector. So even when they're tucked away you'll still be visible in the evening traffic. 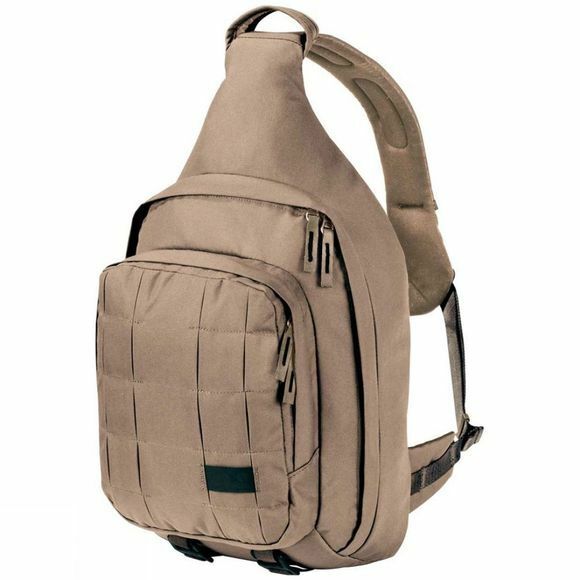 The main compartment and front compartment have plenty of room for your big city survival kit. Another cool feature is the detachable key tape with bottle opener.